There are days, especially during this lovely long hot summer, when you don’t want to spend too much time in the kitchen. Cooking needs to be fuss-free and the food not too heavy. Here we have a recipe that fits the bill. 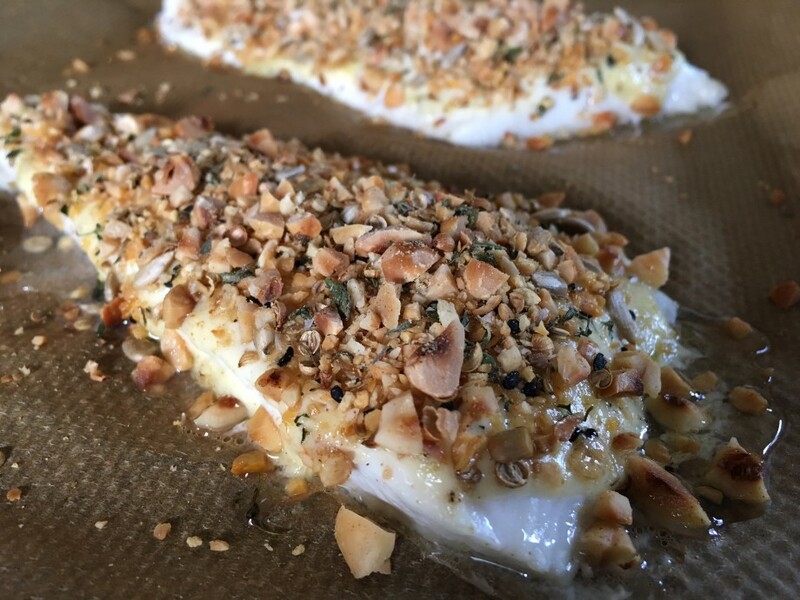 This nutty crunchy topping compliments the delicate flavour of halibut. You could try it with hake too if halibut is not readily available. You can make your own dukkah or buy supermarket versions which are very acceptable. Heat the oven to 200˚c , fan oven 180˚c , mark 6. Put the hazelnuts on a baking tray and toast in the oven for 4-5 minutes until golden. Leave to cool then finely chop. Mix with the dukkah, thyme leaves and season with a little salt and ground black pepper. 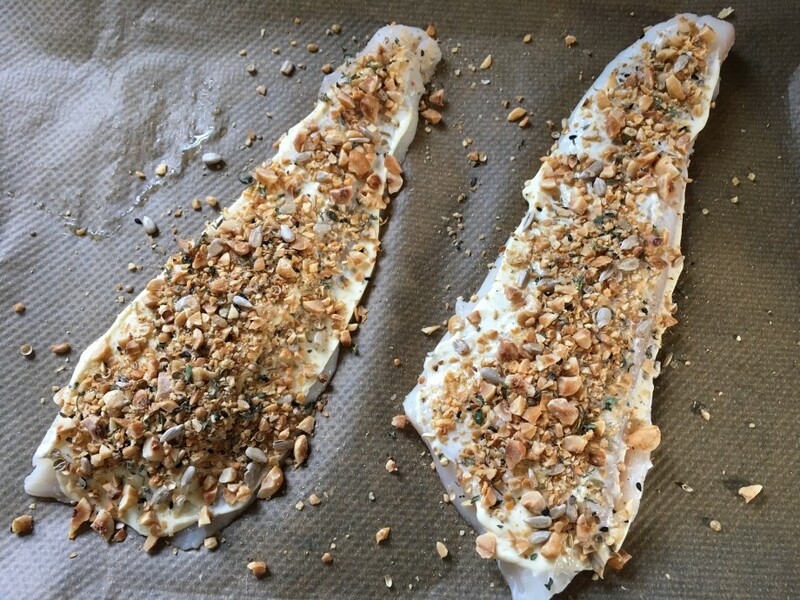 Season the fish fillets with a little salt and ground black pepper and lay on a baking tray. 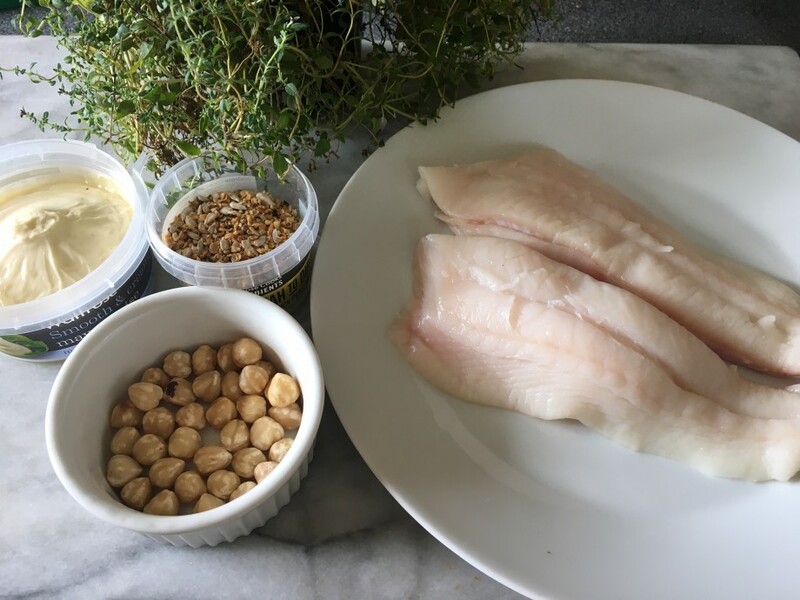 Spread the mayonnaise over each fillet and sprinkle over the dukkah mixture, pressing down slightly. Roast in the oven for about 10-15 minutes depending on the thickness of the fish-these fillets in the shot only took 10 minutes. Serve the fish with lemon wedges.